Need a wonderful gift for your big sister or a special woman in your life? The "Big Sister" Charm Bracelets by Luvalti is the perfect sisters bracelet charms to "wow" her! Heavy chain design is sturdy and very visible, making this a great gift for Big Sisters, birthdays, or any special big sister occasion. 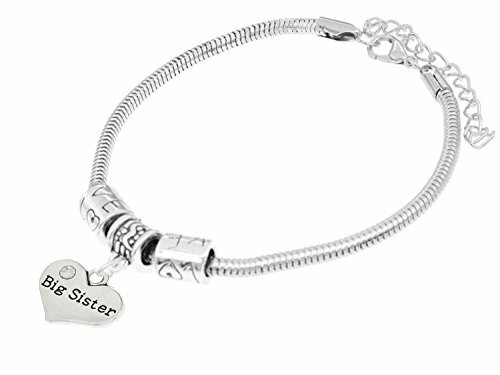 Sisters are so special in our lives, get your big sister or a wonderful woman the "Big Sister" Charm Bracelets by Luvalti and let her know you're thinking about her! Heart-shaped pendant is highlighted by dozens of lovely silver crystal that sparkle and flash in the light. Banner-style "Big Sister" across the middle lets everyone know this big sister is special! Braided chain design is a classic that never goes out of style. Compare other jewelry charms before you buy, this heart bracelet charm is beautiful and affordable, with high quality design that stands the test of time. The lobster-claw hook is sturdy and won't come undone too easily. This is the beautiful silver charm bracelet you've been waiting for to treat your big sister! This is a beautiful and fun gift any big sister will love! The bracelet is solid and slightly heavy, for a lavish feel. 100% zinc alloy chain is hypoallergenic, completely non-toxic, and is gentle on skin. The jewelry charm is almost a full inch square, easy to see and with a lovely sparkle from the dozens of authentic silver crystal in a heart-shaped design. Inspiring and so much fun! CLICK NOW TO PURCHASE, this silver chain bracelet is the ultimate thoughtful Big Sister bracelet! ✅ WHILE OTHER GIFT BRACELETS come in poor quality, break quickly, and do not even look like their picture, Luvalti jewelry is made of high quality alloy with perfection in mind. This means that you will be pleasantly surprised by the superior design, quality, and durability. ✅ GIFT YOUR LOVED ONES PRECIOUS FEELINGS and celebrate the unique love by presenting this personalized family bracelet. Luvalti Personalized Jewelry is The Language Of Love! Grab yours TODAY! ✅ FALL IN LOVE WITH BEAUTIFUL DESIGN AND PACKAGING - 7.8" bracelet with an adjustable lengthening chain and lobster clasp fits perfectly on any wrist. 1.06" x 0.66" heart pendant with words "Big Sister" engraved. This bracelet comes with a PREMIUM Black Velvet Pouch Which Makes it a great gift for birthdays, Christmas and holidays, or just to say "I love you!" ✅ WE STAND FOR HIGH QUALITY AND PROVIDE 100% SATISFACTION GUARANTEE - If at any point you are not satisfied with this bracelet, simply write us a message and we will refund your purchase or send you a replacement within 24 hours. We will make it right for you even if you contact us a few years after the purchase. ✅ WE ARE REAL PEOPLE WHO USE OUR OWN PRODUCTS every day. We expect the best for our family and want the same for yours. Click 'ADD TO CART' Button NOW and grab this deal before our limited time offer expires! If you have any questions about this product by Luvalti, contact us by completing and submitting the form below. If you are looking for a specif part number, please include it with your message.